The IDRC Finals are being held at Auto Club Speedway in Fontana, October 16,2011. Entry to race is $80, Spectators pay just $20. Racing starts at 9am, with classes for everything from fun runs for street cars, to eight second drag cars. It would be great to see a few more GT-R's out at the events again. It has been a little while since we have done a meet at the event. It seems like most people would rather go to a car show and hardpark, than run their car down the dragstrip. 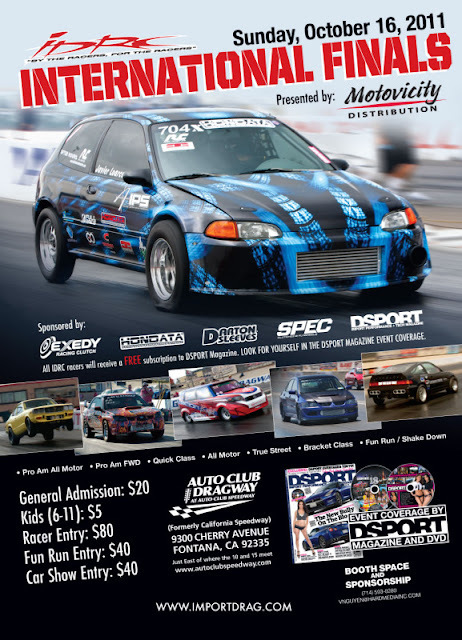 Sunday October 16th, 2011 at Auto Club Dragway, Fontana, CA. Are you ready to run what you brung? It doesn't matter how fast your car is or isn't. There's a bracket class for you to win within the IDRC's bracket classes. Open to all import and high-tech domestics from stock to dragsters. The bracket classes feature the best foot brake (no delay box) racing action. Vehicles can be mild to wild, full race or full street. Bring mom's car, it's time to have fun! A perfect time to just enjoy your car on the 1/4 mile drag strip or to do some test passes to see what your vehicle is really capable of. Looking for real street performance? Check out the IDRC's True Street Class. With all cars running on D.O.T. radial tires, through the mufflers and in "street legal" trim, the IDRC gives the local "Kings of the Street" a chance to become national heroes. Similar to the Quick and Street classes, all vehicles in this class are encouraged to maintain the factory chassis construction. Variations from the factory chassis restrictions will result in additional weight asessments as outlined herein. The original "heads up" import drag racing class continues to the sport most popular. Pioneered by Turbo and Hi-Tech Performance Magazine, this class has evolved to present leading edge technologies while still maintaining its original purpose - to showcase the performance available from today's production compacts. All vehicles in this class maintain the factory chassis construction. The highly developed quick class rules allow many different makes and models to be competitive in the same class. This allows for manufacturer rivalries, as well as the constant front-wheel drive versus rear-wheel drive showdowns. Competitive cars currently run in the 9's or 10's at sea-level tracks. All racers MUST scale after every pass. Failure to scale during qualifying means the run will not count. Failure to scale during eliminations will result in disqualification and reinstatement of the losing competitor, providing they also scale and make minimum weight. 2013 Nissan GT-R SpecR? Evo? Nording?